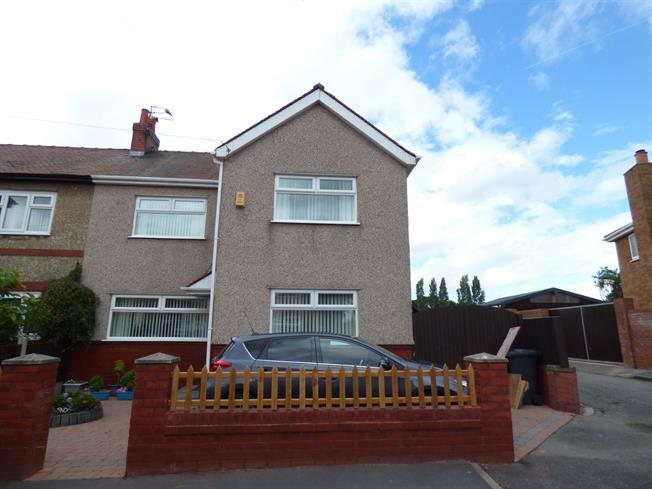 3 Bedroom Semi Detached House For Sale in Liverpool for Asking Price £200,000. Entwistle Green are offering for sale this lovely three bedroom semi-detached family home. The property briefly comprises; dining hall, double aspect lounge, kitchen diner, utility shower room, first floor landing, three bedrooms and a family bathroom. The property further benefits from beautiful front and rear gardens with a stunning rear outlook. Early viewings of this impressive home is highly recommended. Double glazed uPVC window to front and side. Tiled flooring. Radiator. Staircase leading to first floor landing. Double glazed uPVC windows to front and rear. Solid oak flooring. Fireplace and surround. Radiator. Fitted wall and base units with complementary work surfaces. Integrated oven, hob and extractor hood. Worcester combination boiler in unit housing. Tiled flooring. Double glazed uPVC window to rear. Breakfast bar. Double glazed uPVC window and door to garden. Shower cubicle. Low level wc. Wash basin. Tiling. Double glazed uPVC windows to front and rear. Radiator. Shower cubicle with thermostatic shower. Low level wc. Wash basin. Tiled flooring. Tiled walls. Attractive garden and driveway to front. Rear enclosed garden with lovely sunny aspect and is not directly overlooked. Detached garage.